Although director Zack Snyder and Warner Bros. have already given fans their first look at the costumes that will be worn by the main superheroes of Batman v Superman: Dawn of Justice, there hasn’t been much in the way of detailed looks outside of concept art and grainy snapshots. That changed today. Hours after the first plot synopsis for the 2016 blockbuster was revealed, we now have our best looks yet at what Batman, Superman and Wonder Woman will be wearing in the next DC Cinematic Universe installment. 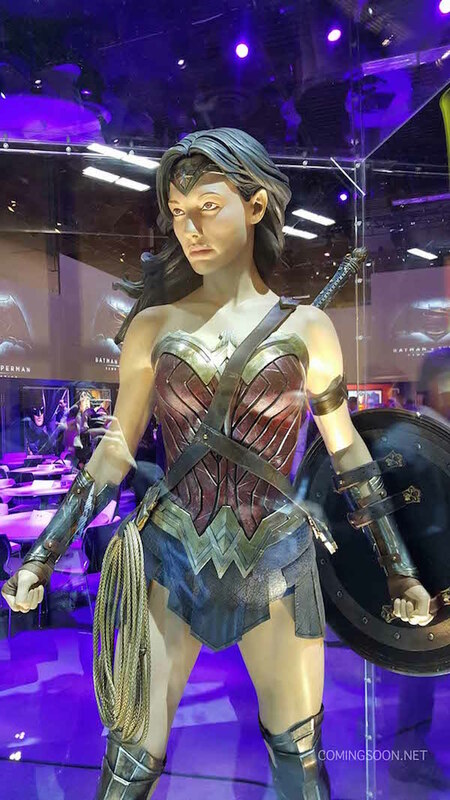 We’re expecting to see footage of these heroes at San Diego Comic-Con next month, but in the meantime, Coming Soon has snapped photos of the full costumes on display at Licensing Expo 2015 in Las Vegas. While you can head to their site to see the full gallery of photos, we’ve gone ahead and analyzed the intricate details of the DC Trinity’s movie suits - though it’s just mannequins showing them off rather than Ben Affleck, Henry Cavill and Gal Gadot. Still, it’s worth pointing out that it’s great to see these costumes in full color instead of those filters that director Zack Snyder loves to use. Most of the previous cinematic Batman costumes have been either completely black or dark blue, but we’ve known for a while that Ben Affleck’s Bruce Wayne will be rocking the gray and black color scheme in Batman v Superman: Dawn of Justice. Looking at it up close, the suit’s fabric blend gives it more of a homemade look than those rubber or Kevlar costumes did, though the fabric is covering some kind of plating underneath that no doubt functions as body armor. Given the influence that The Dark Knight Returns has on this movie, it’s no surprise that the cowl’s ears are shorter and the emblem is larger than usual. 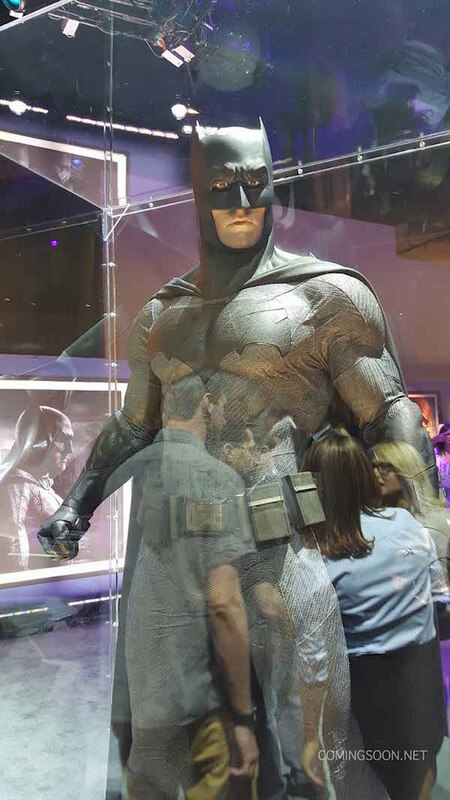 The mannequin’s head is angled slightly to the left, implying that, like Christian Bale in The Dark Knight and The Dark Knight Rises, Affleck will be able to turn his head. However, unlike Bale’s helmet-like cowl, Affleck’s cowl is attached to the cape. What especially caught my eye was his yellow utility belt, which has rectangular compartments on the side. Aside from perhaps the belt Adam West wore in the 1960s TV show, this by far the most comic book faithful utility belt we’ve seen in live-action. Bruce Wayne may not be able to pack as many gadgets in there as his comic book or cartoon selves, but you can definitely see him keeping a few smoke bombs or Batarangs on his person. 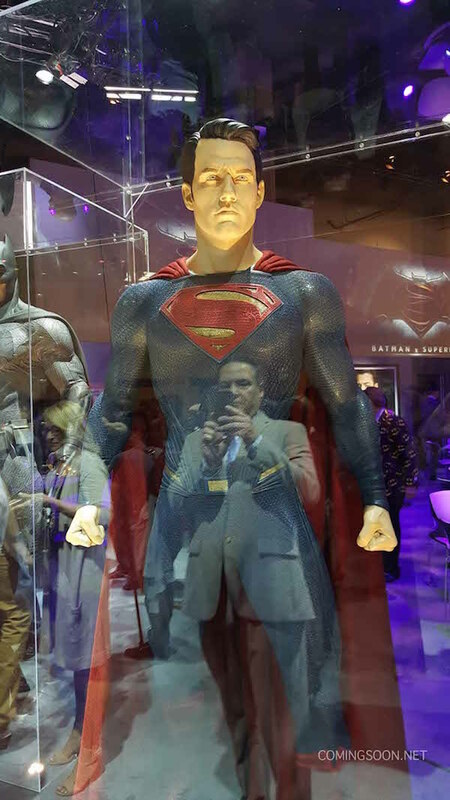 Although there isn’t as much to chew on compared to Batman and Wonder Woman, Kal-El’s new costume in Batman v Superman: Dawn of Justice does have some differences from the suit he wore in Man of Steel. Now that we’re looking at it outside of dreary conditions, the suit’s color looks like a lighter shade of blue from last time. The ’S’ shield is more angular and curved compared to its straight-edged predecessor, and also looks a little smaller. The design on his waist has also been altered to look more like a belt, with the centerpiece now a rectangle instead of an oval. Other than those adjustments, there doesn’t appear to be any major changes for Superman. The shade of red looks the same, the boots haven’t been altered and that distinctive weave pattern is still there. Hey, if it ain’t broke, don’t fix it. The first image of Wonder Woman released last year made it look like her suit barely had any color, but thankfully that isn’t the case. What we have for Diana of Themyscira is essentially a blend of her classic costume and warrior’s garb. The ‘W’ symbol can be seen on her chest and belt, the red and blue color scheme has been retained (albeit in darker shades), and she’s wearing her famous tiara. However, keeping in with the DCCU’s grounded tone, this outfit looks less like a superhero costume and more like what one would wear to battle. The chest piece is armor and the leather skirt is arguably more functional than her usual "bathing suit." The boots have also been changed from red to gold, and frankly look more utilitarian. To further emphasize her being a warrior, not only is she carrying her iconic Lasso of Truth, but also a sword and shield. The final addition to the ensemble is those arm guards, which offer some protection against blades. It’s easy to see how the New 52 has inspired this look, and while Diana will soon begin her career as a superhero, right now she’s in full warrior mode. There have also been reports that she will be wearing several different outfits during Batman v Superman: Dawn of Justice, one of which includes a cape. So although the above image may be her main costume, don’t be surprised if she switches up her attire at some point.